World's largest trampoline–this extra large trampoline is colossal! An excellent choice for those who want the biggest trampoline and the best trampoline ever built. It is like having your own trampoline park right at home. Enclosure sold separately. 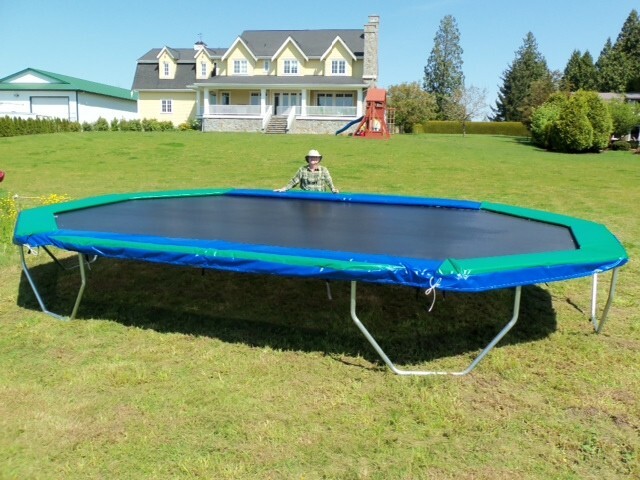 The Sundance 16' x 24' Goliath is our largest trampoline. This is a huge trampoline with 800 lbs or more weight capacity. The above picture shows the trampoline without the safety pads, however, the safety pads do come complete with the trampoline. Enclosure systems are available for this trampoline. JUMPING SURFACE: ( 260 Sq. Ft.) Sundance sets the industry standard. The colossal sized 13' x 21' "air flow" jumping surface is made of the highest-grade, non-abrasive, polypropylene mesh. Designed for permanent outdoor use, this totally weatherproof fabric can be left outside, sun, rain, or snow. SPRINGS: ( 224 - 9" long ) Absolutely the best in the industry! These high performance, heavy duty, galvanized steel springs will last for many, many years. SAFETY PADS: (2" x 15"ends) (2” x 24” sides) Deluxe Plus extra wide padding with industrial grade 18 oz. weatherproof & UV resistant marine vinyl covering with 1.75", high-density closed cell foam. FRAME & LEGS: Super heavy 6 piece double trussed frame rail system. The frame is 12 gauge 2.38" galvanized steel frame rails with 9' of external trussing and under- trussing. (2000-lbs. + capacity) with Legs: 6 - 1 piece U-shaped legs.